Marble is a precious material that can be forged into decorative or ornamental articles without time whether these are modern or antique, warm or cold all that is required is to choose the type that mostly befits one's taste. To have an idea of what can be created out of marble moreover what can be realised with it, one may simply visit Azul in Milan. Its showroom is in a loft on three levels where visitors are astounded by the use of this stone on mosaics, floorings, columns, bathrooms and swimming pools. Azul's showroom is used as a prestigious location for special events, as well, but it is naturally and above all a showcase for its clients. Azul is involved at 360° in its business, from the quarry extraction phase, to the projects and its accessories' designs right up to completion on a "turn key basis". 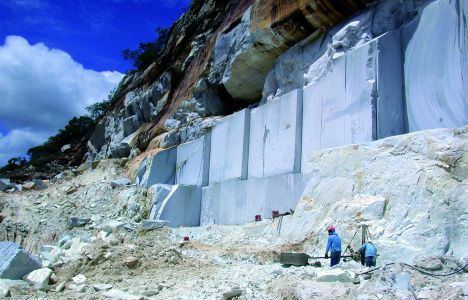 Quality is guaranteed by the company's tight network of transcontinental quarries enabling it to follow the selected pieces from the said extraction phase all the way through to the finished product. There are thousands of types of marble in Nature, granite, stones and travertine that differ from one another in colour and grain but also in their technical characteristics such as in the hardness of the stone, its imperiousness and resistance to external agents. For this very reason Azul has a panel of consultants to help clients in choosing the right type of marble according to its final use. Azul's technology enables it to offer furniture trimmings and embellishing objects and finished fittings such as kitchens, bathrooms and pools in every shape or form limited only, indeed, by the designer's creativity. The experience accumulated over twenty years of business activity puts Azul in a position to assist constructors and architects or project designers both in Italy and abroad in developing exterior or interior designs as well as in the décor. 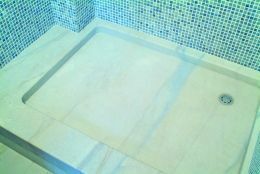 The company deals in exclusive stones such as the "Azul Macaubas" which is a sort of quartzite from Brazil with numerous shades of blue to an off white and darker intense tones. The "sky Pearl" a recently discovered stone, that is fascinating due to the contrast between its natural soft tints and its pastel blue grain, also comes from Brazil. To really appreciate what can be realized with these natural stones one may visit the showroom in Via Lodovico il Moro, 17 in Milan. For further information please contact: Azul, Tel:+39 02 817551 or visit the Website: www.azulitalia.it.